This Christmas, like many Christmases before, I was involved in making a lasagna. This year I was the pilot of the operation, but many times in the past I was the sous chef for my mother’s one signature dish. It isn’t that my mother wasn’t a good cook, she was, she just didn’t have the time to be passionate about cooking, except for one dish, the lasagna for the Christmas dinner. Back in the day, the hub-bub of Christmas Eve started around 6 pm. A feast was had by all and the presents were all opened before midnight and the last of the cocktails clinked before the party petered out around one a.m. Mom would rise early and start the meat sauce. The tomato sauce would always have plenty of Italian sausage and ground meat, maybe a few ribs or piece of pork roast. I would rise and sauté down the onions and peppers, adding them to the thick sauce. Mom would cook down the lasagna noodles, chop the cheese and heat the oven. Once she layered everything, she would cove it with tin foil and relax for a bit before putting it in the oven. That usually got people waking up and close friends showing up for a relaxed meal by the light of the Christmas tree. Just as he was there the night before for shrimp scampi and Christmas Eve antipasta, my old friend Mike Schwed would make it down for Mom’s Christmas lasagna. As one of her final gestures of each Christmas Day, my mother would wrap a piece of lasagna for Mike to bring to work the next day and one for his brother Lou, who I think she met once. They shared a bithdate. It is a fond memory I revisited making this dish, this year. I’ll save a piece for Lou! It all starts with the meat sauce and this part can be done a day or two before if you believe as I do that it just gets better with time. Cook down onions and peppers in a big pan with some olive oil and salt. Stir in tomatoes, tomato paste, water, sugar, 3 tablespoons parsley, basil, peppers, 1/2 teaspoon salt and pepper; bring to a boil. Reduce heat; simmer, uncovered, 30 minutes, stirring occasionally. Meanwhile, in a Dutch oven (or a pan) , cook sausage, beef over medium heat 8-10 minutes or until meat is no longer pink, breaking up meat into crumbles. Add garlic; cook 1 minute. Drain. Stir chopped sausage and meat into sauce. Cook noodles according to package directions (8-10 minutes); drain. In a small bowl, mix egg, ricotta cheese, spinach, and remaining parsley and salt. Preheat oven to 375°. Spread 2 cups meat sauce into an ungreased 13×9-in. baking dish. Layer with three noodles and a third of the ricotta spinach mixture. Sprinkle with 1 cup mozzarella cheese and 2 tablespoons Parmesan cheese. Repeat layers twice. Top with remaining meat sauce and cheeses (dish will be full). Bake, covered, 25 minutes. Bake, uncovered, 25 minutes longer or until bubbly. Let stand 15 minutes before serving. Yield: 12 servings. 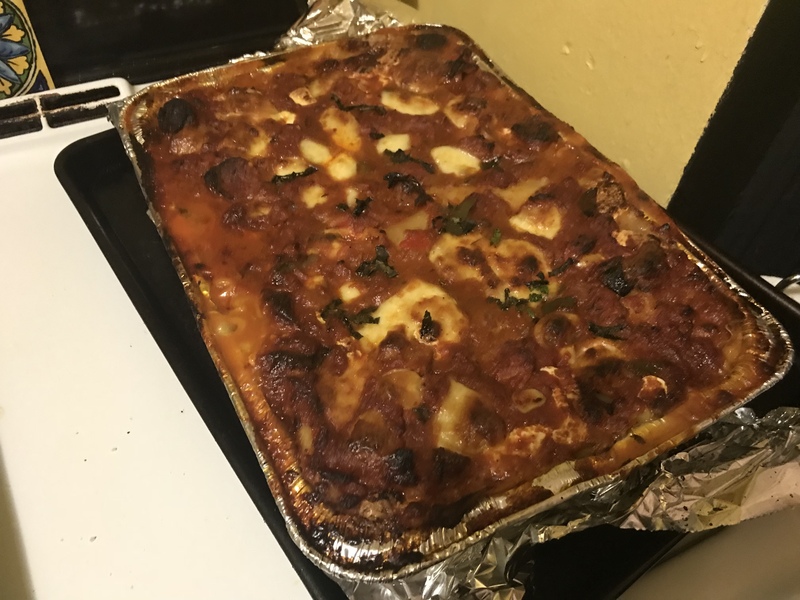 Some of the best meals you will have during “inter-week” (the days between Christmas and New Years) will be reheating this Lasagna. Don’t hammer it during the first cooking and keep some extra sauce on the side to add to reheats. Ciao! and Slainte! Mi Amigos! And I remember Mommy making your own special one because you didn’t like ricotta cheese.